The insurance of endurance sport possessions, alongside cover for event entry, is an expanding area – particularly across the triathlon and cycling communities. 2014 in particular saw specialist insurance businesses target the endurance sport community – offering protection for damage to multisport valuables and providing cover in the event that an athlete has to pull out of a race due to illness or injury. 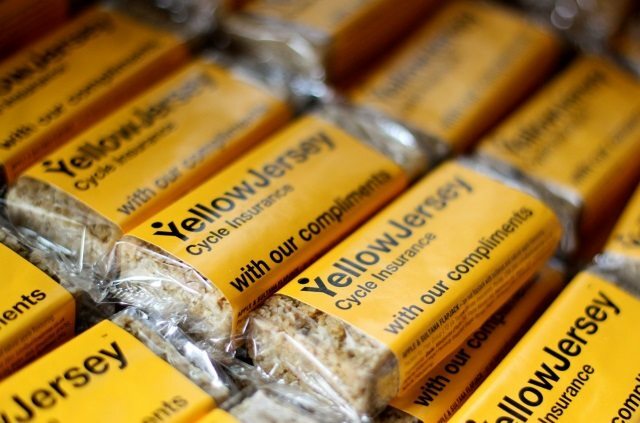 Entering the fray in 2014, Yellow Jersey Cycle Insurance has been stepping up a gear with new, unique policies bespoke for the triathlon community. It hit the UK triathlon scene with a high profile sponsorship deal at the 2014 PruHealth World Triathlon London event in Hyde Park. Following this, the company became Official Cycle Insurance Supplier for the British Triathlon Federation. Ryan Georgiades (RG): Our main insurance firm was first established in 1989. It is a family business; very much a classic insurance company that was founded by my father – a serial entrepreneur who is still involved in the company. In recent years, as the insurance market has changed, we have been increasingly evolving our product offering. We have essentially adapted to the changes in the market; and as a broker have moved into more niche areas. In the same way that independent cycle retailers have had to adapt to the advance of the internet, we find it is increasingly important to be specific in the service that we provide and the added value we give to our customers. TriBiz: So, with your insurance background, how did the niche area of tri and cycle insurance come about? RG: After a less than healthy lifestyle, I got back into sport around 6-7 years ago. I had got really fat! So, having turned 30 I joined the Clapham Chasers Running and Triathlon Club. I did a marathon and from there I got captivated by a new change of lifestyle. I started doing triathlon and went from being over 20 stone (127 kg) to a healthier 13 stone 10 lbs (87 kg). This was very much a turning point in my life and for the business too. TriBiz: So, participation in triathlon was a trigger for Yellow Jersey? RG: Definitely. I did Ironman Austria in 2013 and at that point I was certainly addicted. It’s a common theme once you’ve tasted the sport in that it’s very much an addictive thing. You also mix with others doing the sport; and that’s when the enquiries about insurance started to come about. Questions about appropriate ways to insure a bike kept cropping up. So, we started looking at the area much more closely. TriBiz: How easy was it to leverage your existing business? RG: The background and infrastructure certainly helped, but this was very much a new start-up. We didn’t have an existing client base and we essentially built the business and the policy from the ground-up. We did business plans, invested our own cash and we built the website and the necessary back-end. Then, we hit the ground running. It was always clear that triathlon, cycling and other endurance sports are very different propositions from other types of insurance. Of course, in the UK, motor insurance is compulsory. Whereas, cycle insurance, for example, is very much like pet insurance. It’s not mandatory and it’s really about the love of the bike in the same way as an individual would wish to care for their pet. Tri and cycle insurance are about protecting that passion. It’s not compulsory. So, it’s something that does need some education and the consumer needs to believe in what they are purchasing. TriBiz: Are there any other areas that set tri and cycle insurance apart? RG: There are specific aspects to the multisport lifestyle; and we worked to make the insurance attractive and applicable to these areas. We have reworked a number of exclusions that would apply in standard insurance policies. So, for example, cover in transit. Many policies can exclude the necessary cover when a bike is being transported by an airline. We ensured that this cover was in place at the outset. So the policy covers the cost of having a replacement or hiring a bike at an overseas event if the worst-case scenario happens, with the bike turning up in pieces or not at all. We’ve also introduced fee cover on event entry as a matter of course – to protect if an athlete becomes ill or injured. Also, in addition to the clauses on offer in a policy – it’s very important that making a claim is a straightforward and easy process. As a broker we have a strong agreement in place with the insurance provider. This means that Yellow Jersey itself gets the final sign-off on a claim. Here, we can apply our cycle and triathlon and expertise. This gives us that unique position to be able to actually sign off a claim. Generally we find that the triathlon community is comprised of honest and trustworthy people. So we have trust up-front to presume that any claim is a legitimate one. TriBiz: How did you roll-out the business when you launched this year? RG: Yellow Jersey was launched in May 2014. Essentially it was a soft launch. We then seized the opportunity to tie-up with the ITU World Triathlon London event in Hyde Park. Here, we had a good deal – with ITU giving us exclusivity; and the event presented an opportunity to engage with thousands of athletes over a number of days. It was great to see our brand up there on banners and other signage via BBC TV coverage. The event provided a good press story and really got us on our way. 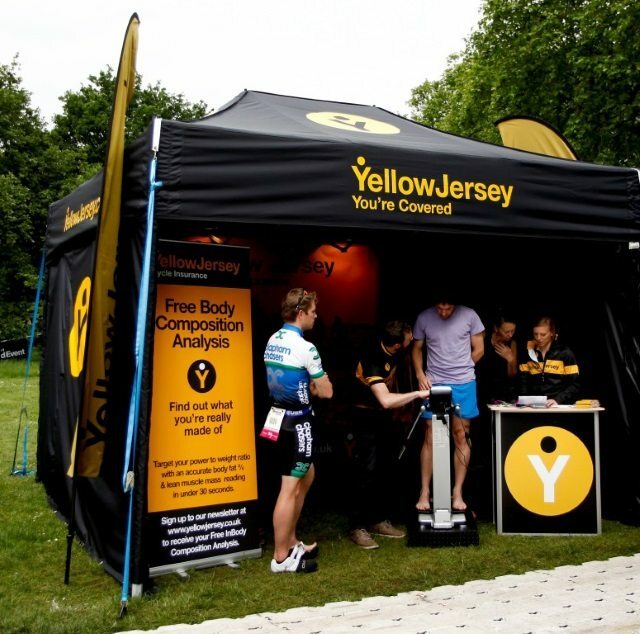 We also put in place a number of initiatives in the road cycling area; and whilst we were at the Hyde Park event we brought in a body composition analysis machine to look at fat and muscle distribution in the body. Having done this, we found that triathletes were queuing outside the door. It’s clear that triathletes are really interested in finding out more about their own fitness. This gave us a point of engagement and a way to communicate on insurance-related issues. From our conversations we found the majority of triathletes had several bikes each valued at several thousands of pounds. So from the original offering we increased our policy to give £30,000 worth of bike cover and increased our individual limit to £10,000 making the offering far more applicable for the triathlon community. From this, we also introduced innovative features such as multiple-bike discounts (using the principal you can only ride one at a time) and all of these aspects come from talking directly with triathletes themselves. So we’ve been building a business brick by brick. In the summer of 2014 we completed a full calendar of events and this culminated at the Cycle Show 2014 in Birmingham. Here we again utilised the body composition analysis; and again we put ourselves in front of the athletes to help us find out what they think and need for the future. TriBiz: Having engaged with athletes on the ground, how do you see the business scaling up? RG: We believe there is a strong market opportunity and a genuine interest in insurance. While athletes may at the moment ignore the fact that they have limited or no cover, there is a big enough potential market to satisfy our ambition. We feel triathletes are certainly a passionate community alongside road cyclists – and that the communities are willing to buy into the benefits of an applicable, competitive and reliable insurance policy. TriBiz: Talk us through your branding? RG: The Yellow Jersey name is of course linked to cycling and being the best; and that is the concept for our brand. So far, we feel we are doing a good job – with an encouraging number of policies set up in a short space of time. TriBiz: Do you see any particular areas of opportunity for your business? RG: Going back to the body composition analysis, as mentioned, we found this was a way to get people to talk to us; and we saw that triathletes in particular love statistics and love data. Triathletes are very much into their equipment and gear. They often value, and may be quick to adopt, attractive product offerings; whereas old school club cyclists may in some instances be more frugal. We do see opportunities in both communities. Although, triathletes may not have such a conservative mind-set and here we do see a strong opportunity. TriBiz: How did your recent partnership with the British Triathlon Federation come about? RG: Through the work we did at the ITU World Triathlon event in Hyde Park we made contact with a number of individuals at the British Triathlon Federation. From this, discussions evolved. We explored the possibility of providing insurance to Home Nation triathletes; and we became Official Cycle Insurance Supplier for the British Triathlon Federation in December. We’re excited about supporting Home Nation members – ensuring their passion and hard-earned valuables are protected, allowing them to focus on competing and getting the most from their sport. Working with British Triathlon is very exciting. It’s a massive honour and a privilege to be involved with the national governing body. TriBiz: How big a market do you see out there? RG: We see that the only limitation to the size of the market is the education issue and helping athletes understand the benefits of taking out an insurance policy. We could be looking at a £2 billion market. In reality it will be a percentage of this, but the amount of education we can do will clearly increase the scale of the market overall. The key question is how many will convert to insurance and it will take a couple of years of investment to scale up and to tap into the opportunity that we see ahead. Our approach is fairly simple: build a brand, generate traffic to our website and then convert to a policy. In parallel to this direct-to-consumer approach, we have an affiliate network where we are working with independent bike retailers and bike manufacturers. These companies can earn commission if they refer insurance products. We also found in our dialogue with independent retailers that the insurance product actually helps generate bike sales for the retailer. The independent retailer sees this as a way of engaging with their consumers. It’s an added value offering. Often, in the event of a claim, a big box insurance provider will push the consumer to a large wholesaler or a major bike store rather than the individual retailer from which the rider bought the original stolen or damaged product. With our affiliate network, however, we have the authority from the insurance provider to direct the claim back to the same original shop where the consumer purchased their bike. This is of course attractive to the retailer and the consumer alike. TriBiz: How about the international market? RG: We currently have a licence to practice insurance in the UK. So, we will stay focused and consolidate our position. We see that the UK is a big enough market in the short term, but we could look to get our infrastructure expanded into mainland Europe. TriBiz: In what other markets have you witnessed this type of insurance in place? RG: Australia and the United States have a well-established cycle insurance business with similar offerings to that which we see in the UK. 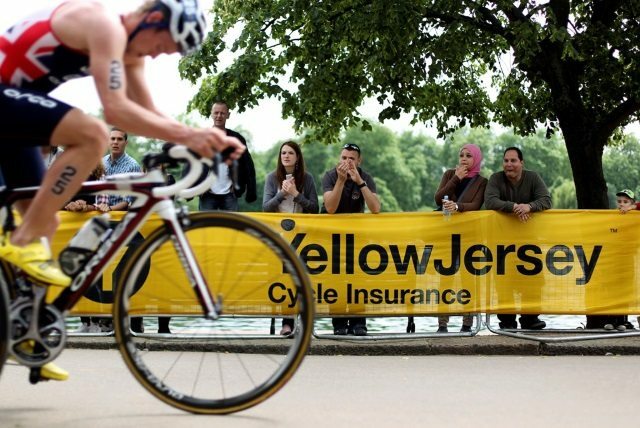 With triathlon insurance specifically, this is perhaps less pronounced and the UK may indeed be leading the way in terms of triathlon specific insurance cover. There are others out there in the US, Australia and South Africa. Although it’s not clear if other policies cover the specifics. So, they may not necessarily have cover for a bike when it is in transition or cover for a wetsuit. We do see event insurance cover is available in some instances. Although, in transition we generally find that there is no cover if the bike is unattended. Bikes can of course still be stolen in transition. So we see that it’s very important to be innovative and adapt to these situations. We provide cover in these specific instances to give the triathlon community peace of mind. TriBiz: Any other initiatives in the pipeline? RG: In terms of other marketing initiatives we have signed up young female triathlete Sophie Coldwell, the 2014 British Triathlon Elite Junior Triathlete of the Year, as a Yellow Jersey brand ambassador. We are particularly looking to develop the female side of the business. We see a massive growth opportunity here, albeit coming from a small base. So, the only way should be up! We have also sponsored female team Matrix Pro Cycling, which is playing an active role in the shaping of the landscape for women’s pro cycle racing at all levels. This includes pro team riders such as Laura Trott through to female juniors. Weirdly we have also been picking up bits and pieces of insurance business – whether that be public liability insurance for events or other forms of cover – as we expand our connections in this industry. So, it’s nice to see that the interest in getting cover is strong! We’re very keen to be going forwards in this marketplace and appreciate that, for the consumer business of Yellow Jersey, volume is needed to maximise the scale of opportunity. This brings us back to the all-important need for education. We shall keep working to enable triathletes, cyclists and the wider endurance sport community to appreciate the benefits of dedicated and specific insurance cover. 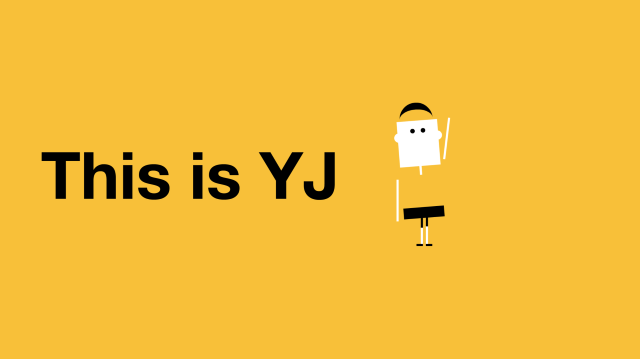 Yellow Jersey Insurance is a specialist cycling insurance brand created by three brothers who are all passionate members of the cycling and triathlon community. 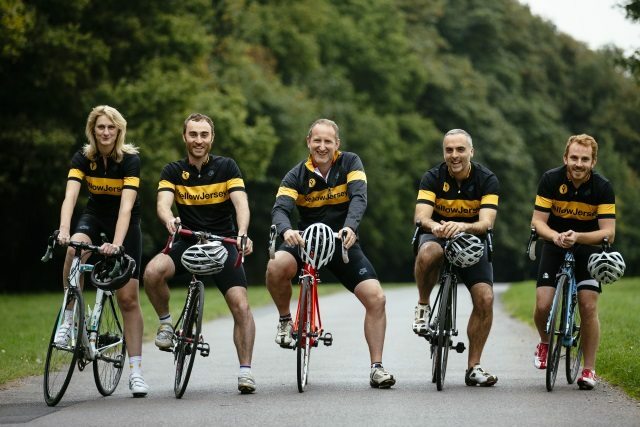 The founders of Yellow Jersey compete, coach and play an active role within the cycling, triathlon and mountain bike arena.